Smart marketing techniques to get your business noticed. Plan a successful marketing campaign and move your business forward with this fully updated edition of an established bestseller. Packed with practical advice from a team of industry experts, this readable guide features all the latest tools and techniques to help you connect with new customers and retain existing ones. From choosing the right strategy and preparing a marketing plan, to igniting your imagination and producing compelling advertising, you'll be creating a buzz and increasing profits in no time. 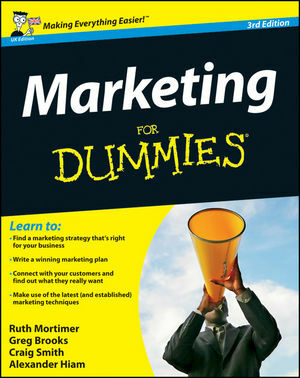 Ruth Mortimer is the Editor of Marketing Week magazine. Greg Brooks is Global Marketing Director at media agency Mindshare. Craig Smith is the former Editor of Marketing magazine and is now Communications and Content Strategist at Persuasion Communications. Alexander Hiam is a consultant whose clients include many Fortune 500 companies.